I just returned from a relaxing escape in Key West. It was nice to be in sunny warm weather and have no set agenda for each day. 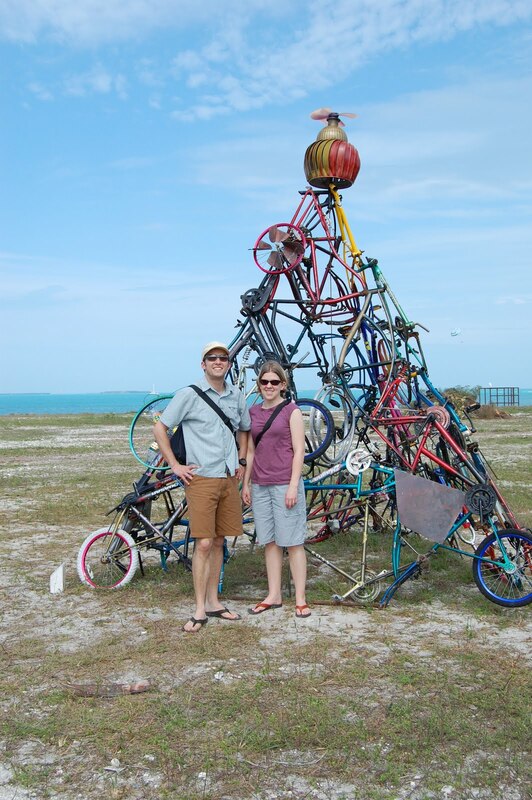 I saw some great sights, including this fantastic sculpture show along the beach at Fort Zachary Taylor State Park. Eric and I loved this kinetic sculpture made from bikes and other scrap metal. There was one sculpture in particular that my dad really liked. It was a large red letter Y standing on the edge of the land so that the ocean was the backdrop. He had my sister, husband, and myself stand next to it and spell out YMCA. Har har. I have not seen the picture yet, but I am sure it was amusing. This is the red Y. In any case, it was inspiring. I know that working and living in a tourist trap would be difficult to say the least. However, I could not help but find myself wondering how I would fare in Key West as an artist. I know, I know, I have to actually make some artwork first. I have the rest of this week off from work, I may as well start/finish something, right?